Zombies And Toys: Gorgeous & Gory 2013 Calendar: the future never looked so good ! 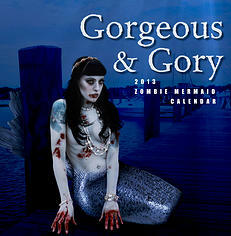 Gorgeous & Gory 2013 Calendar: the future never looked so good ! As we sit on the brink of the impending apocalypse (thanks to the Mayans) - we as a collective group are surely focusing on what we must do in order to prepare for survival. Weapons, food, first aid & shelter are certainly all a given, but what if you need to keep track of the days AFTER the end of the world, and don't mind looking at some beautiful (and dead) women while we do it ? Gorgeous & Gory, lead by the talented Dead Flesh columnist Jessica Rajs, designer Sean White & complimented by a team of special -effects makeup artists, present to all of us their 2013 calendar which not only spotlights 13 bodacious beauties........post-mortem....but adds to the scenic mind-melt by turning these date-fillers into ZOMBIE MERMAIDS !!! ( look out Ariel, these chicks aren't Disney-friendly !) Each full -color picture is graphically stunning, and with a full 11''x22'' layout when opened up, you have more than enough room to fill in your important appointments in the ample-sized date-boxes. These eye-catchers are currently available for sale at www.gorgeousandgory.com - so head on over and pick one up for yourself, and grab a few more for X-mas gifts.....look at it this way.... if the apocalypse doesn't turn out being on the date as advertised, your gonna need a killer calendar to get you through 2013, so why not revel in the heart-stopping beauty of some zombie mermaids ?? HAPPY HOLIDAYS ! !